The Counties Racing Club takes centre stage this week with a number of Black Type races, including the Group 2 Auckland Thoroughbred Stakes – a time honoured race whose honour roll includes the mighty Sunline who won the race twice. 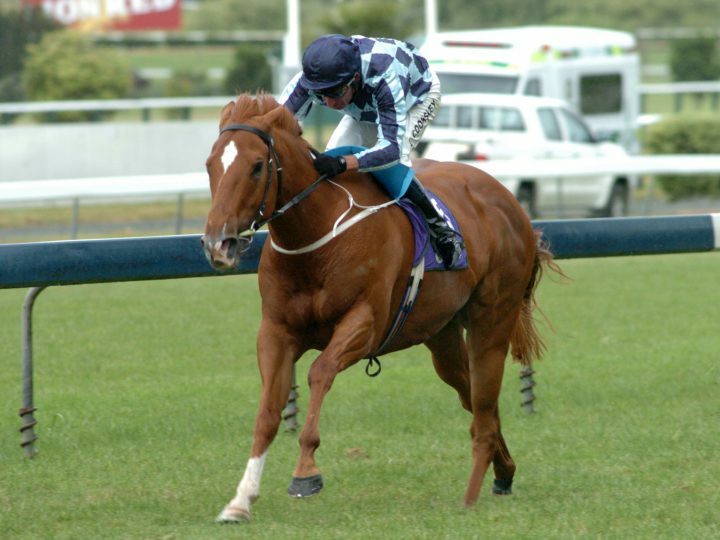 In 2005 a lightly raced Pins mare called Viennetta showed she was up to the best mares in New Zealand with an impressive victory in the 1400m feature. Back in 1999, then Dannevirke farmers Kevin and Julie Taylor were at home when a fax came through from Bloodstock Agent Michael Otto letting them know of a mare that could be purchased by the name of Bali Sugar, who was in foal to Gold Brose. She was a good race mare whose career was cut short by a very nasty fall at Ellerslie on Boxing Day in 1994. Being a Group placed daughter of the Stakes winning mare Tasman Dancer, the Taylor’s were quite keen to purchase her. The resultant foal was a filly named Marzipan, a winner of two races. After an unsuccessful attempt to get into foal in 1999, the Taylor’s sent their mare by Christmas Tree to Waikato Stud’s first season sire Pins. In early October 2001, Bali Sugar foaled a very strong chestnut filly. The decision was made to keep the filly and she was sent to Te Akau Stables and Mark Walker. Keeping the ‘sweets’ theme when choosing a name, she was called Viennetta after the icecream. She showed above average ability from day one and won a trial as a 2YO by six lengths. She would make her race day debut a couple of weeks later with a strong win over 1200m at Te Rapa. Asked to step up to Group 3 level at her next start, she wasn’t disgraced and was turned out for a spell. Resuming at Taupo in the middle of August, she ran second to the Group 1 placed Manten before an unplaced run in the Group 3 Highview Stakes. Unfortunately, at this point it was discovered she had a small chip in a fetlock joint, so she was operated on to take the chip out. The Taylor’s wanted to give her a good spell so she wasn’t seen again for 12 months. They also made the decision to keep her a bit more local, so she recommenced her career under the tutelage of Nikki and Peter Hurdle. It didn’t take her long to get back into the Winners Circle – at just her second start back, the Hurdle’s took her to Tauherenikau and she was very impressive winning over 1300m. Given three weeks between runs, she was again put in the ‘deep end’ taking on a very strong field of mares in the Group 2 Auckland Breeders Stakes. Drawing well in barrier three with Grant Cooksley in the saddle, she jumped well and settled outside the leader. As she came around the turn, Cooksley slipped her some rein and she dashed clear of her opposition for a three length victory. Showing she was up to the best mares in the country, she was given a break and was set for the Group 1 Te Aroha Breeders Stakes in April. Given a ‘preparation’ run, she proved too good for five opponents at New Plymouth, which had her on target for the Group 1 two weeks later. With Darryl Bradley in the saddle, she jumped well from the barrier and was able to box seat just behind the leaders. As they came into the straight, she quickly took control of the race, going on to win comfortably by 1 ¼ lengths. Everybody was elated…. the Taylor’s had their Group 1 winner, Pins had another Group 1 winner! Then it was declared that there was a protest, third placegetter Salsa against the winner Viennetta for interference early in the straight. In New Zealand, the rule was if the horse who suffered the interference costs then from finishing in a higher position, the horse who caused the interference is relegated. While Viennetta was dominating out in front, Arlingtonboulevard was able to grab Salsa in the last stride to grab second. Salsa’s connections argued that Viennetta brushed her (as she went past) and that cost her hanging on for second. The stewards agreed and Viennetta was relegated to third. As far as I’m aware, this rule was changed shortly after and is now similar to Australia where the horse that was interfered with would have finished ahead of the horse that caused the interference to win the protest… if this was the rule was in place in 2005, Viennetta would be a Group 1 winner…. After 13 years, reminiscing this might still be too soon for some people! Given a break, she was brought to Australia by the Hurdle’s but after two runs, she was retired to stud. She produced the Group 3 winner Golden Archer, a winner of eight races including five at two and currently at stud in Queensland while her daughter Neapolitan was stakesplaced. Viennetta’s Sacred Falls colt was one of the highest priced yearlings by his sire at Karaka earlier this year and sold for $230,000 to the bid of Mulcaster Bloodstock and the Kaha Syndicate. Unfortunately, the Taylor’s who now own Koru Thoroughbreds at Ohaupo lost Viennetta earlier this year but they do have two daughters to breed from.